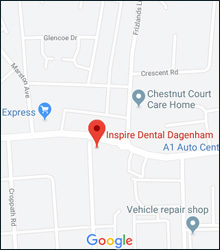 Here at Inspire Dental Dagenham we offer you the best of both worlds – traditional NHS dental treatments and the option of affordable Private Cosmetic Dental Treatments focusing on improving your smile. Our wide choice of treatments means we can help you to maintain healthy teeth and enhance your smile. Our highly skilled team is committed to delivering consistent quality dental services of the highest standards in a modern, relaxed and friendly environment. Love your smile!